If it’s time to celebrate a special occasion like a birthday, anniversary, bar or bat mitzvah or quinceañeras, Colorado has plentiful options for parties that will be cherished long after the big day or weekend is over. There is a whole host of décor companies and entertainment options from DJs, soloists and bands to aerialists and magicians; plus don’t forget providers of fun like inflatables, photo booths, graffiti walls, GPS scavenger hunts and more. You may even want to hand over all the details and tap into the creativity and know-how of an experienced Colorado event planner or destination management company. For a 25th (silver) or 50th (golden) wedding anniversary, perhaps follow the Colorado Gold Trail, a scenic tour of gold rush towns and gold and silver mines that flourished in the boom of the late 1850s. Towns on the trail include Boulder, Black Hawk, Central City, Idaho Springs, Breckenridge, Fairplay, Alma, Como and Leadville. 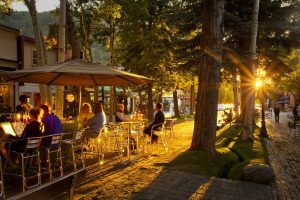 Boulder and Breckenridge in particular have a wide range of options for venues and lodging, and there is even a mine to tour in Breckenridge. If pro sports are more the style of a celebrating couple, birthday boy or girl, or a retiree, head to pro sports games in Denver and utilize the venue’s meeting or event space or a nearby tavern or restaurant for a pre- or post-celebration. Seek out mezzanines at nightclubs, beautiful private dining spaces at restaurants, rooms with views at hotels or a lovely patio at a golf club or ski area for possible options. Teens celebrating special milestones can plug into places that speak to their interests. Amusement parks, zoos, museums, recreation centers and sports facilities with function space are just some of the many choices. Food and beverages are part of most every party event. For those events with participants ages 21 and over, consider tapping a winery, microbrewery or distillery with event space to host. Some of these facilities can provide the cuisine while others allow food to be brought in. Or chose from many other great Colorado venues that work for all ages and serve food and drink. Consider where guests are traveling from and if lodging is needed. Convention and visitor bureaus, tourism offices and Chambers of Commerce are all great sources of information if you have a particular destination in mind and need guidance for venues and suppliers. Happy celebrating!